Whether chopping wood, shoveling snow or doing yardwork, anyone who’s ever tried to work outdoors in a heavy, nylon winter coat knows the value of a jacket that moves with you. And the women’s Carhartt Full Swing Cryder Jacket is specifically designed for that purpose. Multiple design innovations in the Cryder Jacket made for an extremely flexible and comfortable coat while I shoveled my driveway and cleaned up my snowy yard. Though the specially constructed cotton-blend and thinsulate jacket isn’t the warmest offering from Carhartt, it makes a great transition piece for weather that hovers at or just below freezing. The Cryder Jacket is part of Carhartt’s Full Swing line designed using feedback from hundreds of outdoor workers to fit closer to the body and deliver maximum range of movement. Three features in the jacket make this happen: The Mighty Back, pleats at the back shoulder areas of the jacket, the Freedom Gusset, a panel of extra fabric under the arms, and the Flex Elbow, a stretch panel at the elbows. These features were helpful as I bent and extended my arms to shovel snow, and I didn’t feel like I was fighting my jacket the entire time. The coat’s cotton blend exterior includes two per cent spandex, making it very comfortable but also heavy enough to live up to Carhartt’s durability standards. Not once when I was moving planters and outdoor furniture into the shed did I worry about ripping the fabric. The exterior is also protected with the brand’s Rain Defender technology, a water-repellent finish that helps moisture bead up and roll off. The jacket is washable too, and the Rain Defender finish is meant to retain 70 percent of its strength even after 20 washings. 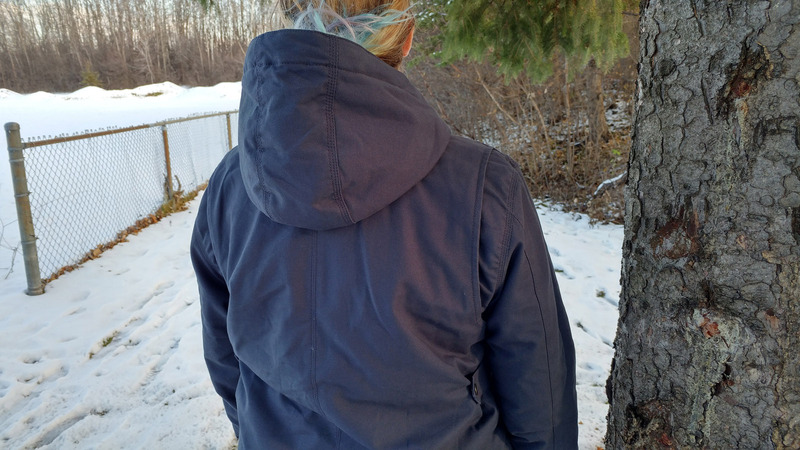 The Cryder Jacket has Thinsulate insulation, which measures a “warmer” on Carhartt’s rather ambiguous warmth scale (the other two being “warm” and “warmest”). I wore it with a thin shirt on an evening that was just below freezing and was plenty warm. The Cryder Jacket is very functional and for that, I’m ok with it not being especially stylish. The deep blue colour that I tried is synonymous with work wear, so the other colour option, a deep wine hue, would make this jacket a little more versatile. The sleeves are fitted around the wrist and long (even for my long arms), with extra length on the top exterior part of the arm that extends to mid-hand. The jacket hits just below the hip and adjustable snaps at the waist help to give it shape. As the jacket is cut relatively straight, I had to size up to fit my hips, but that left me with too much room at the waist even with the snaps (This is a common problem that I have with jackets, however). The neck is high and the hood is nice and deep with adjustable drawstrings to keep your head warm in bad weather. Flexible, comfortable and durable, Carhartt’s Cryder Jacket fits its work wear niche well. Though not especially stylish, this is the jacket you want to reach for when you have a day of outdoor work ahead of you.